As Verizon inches towards the end of its long-promised FiOS expansion, we can finally get a look at all the places these heavily trumpeted fiber cables have actually ended up. 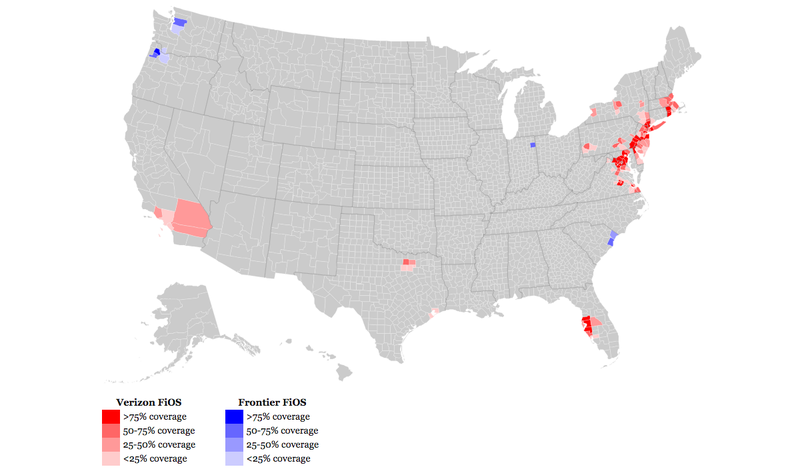 Behold the final(ish) Verizon FiOS Fiber map. It's bleak as hell. The map itself comes from Fiber For All (you can see the full interactive version here), since Verizon doesn't offer a FiOS coverage map of its own, for now-obvious reasons. Although in all fairness, the few places that do have access to the fiber service are generally in the country's more high-density areas. But according to Fiber For All, the number of people with access to FiOS still only hits about 12 percent of the total population. Which isn't a lot, sure, but hey, that's still about a tenth of the population, you might say. But the problem here is twofold. First, Verizon has been trumpeting this thing as the second coming ever since its announcement in 2003. Not only has it been slow on fulfilling the promises it had already made, when it actually did get around to installing FiOS in a city, the coverage was shoddy and not entirely sensical. For instance, after the FiOS NYC buildout, the service would "[skip] buildings, floors, and blocks without clear explanation." The other issue is the significant subsidies allotted to Verizon specifically for the fact that it was supposedly upgrading to fiber cables in the first place. Subsidies that Verizon did some wildly sketchy legal footwork to make damn sure it got. By supposedly upgrading its copper-based phone cables to FiOS fiber, it was eligible for the government subsidies that are supposed to help offset construction costs. Except, as TechDirt uncovered last year, Verizon didn't actually have any increased construction costs. Most likely due to the fact that while its been coughing up the money for its sporadically placed fiber service, it's been neglecting its coper-based phone service almost entirely. 1. When we launched FiOS, we said that we would pass 18 million premises. We have in fact passed 19.8 million (check our most recent quarterly earnings report). That's 10% more than we said we would pass. Both of which are fair enough. They're also somewhat besides the point. 4. This last point is a big deal, because our entry into every market has not only improved the state of broadband for our customers but for the entire marketplace. We've dragged our competitors up the speed ladder with us. These two points have absolutely no bearing on the issue at hand. That issue being the fact that Verizon's already-limited coverage has been notoriously shoddy, all while being perpetually trumpeted by the company itself. 5. Also, what subsidies? FiOS was funded by Verizon. You need only review Wall Street's reaction when we announced the fiber build to understand that? That's just plain wrong and must be removed. The rate increases will generate much needed additional short-term revenues as the company faces the dual financial pressures created by competitive access line losses and the significant capital it is committing to its New York network. In other words, the New York state government is giving Verizon permission to increase their rates expressly because of their intent to lay down FiOS cables. This extra revenue then helps them cover—or "subsidize"—that cost. I'm sorry, Ashley, but this goes beyond an update. The premise is ridiculous, so you have to ask yourself why not take it down or simply write it clearly indicating that these a Group is making unsubstantiated claims against Verizon? Just because someone says the sky is not blue, does not mean that media should report such a thing.